Constructed from all white stress-relieved, acid-resistant, non-corrosive polypropylene, all heat seam welded and tested. Includes a 1-inch front lip for spill containment. Supplied with a heavy duty clear acrylic hinged front sash with plastic hinges. Incorporates a brushless forward curved single inlet blower for optimal performance. One booted light/fan switch with integral circuit breaker. Low air flow alarm indicator for unsafe conditions. Back-baffle for horizontal air flow across the work surface. Accommodates a Size "A" main filter. 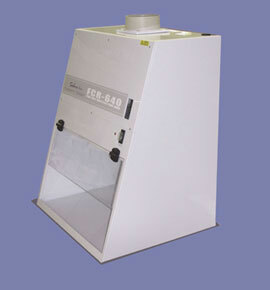 Supplied with one (1) Size “A” electrostatic FILTRETE particle pre-filter. Configured for 120VAC, 60Hz -or- 230VAC, 50Hz (preference requested). Supplied with a 6-inch exhaust collar for ducting when required.